In part one, a special circumsinusoidal region was described, bounded by parts of semicircles, and a sine or cosine wave. As previously described, this requires that the wave’s amplitude be exactly one-fourth the wavelength. Of course, most sinusoidal waves do not have amplitudes and wavelengths that fall nicely into a 1:4 ratio. What happens, then, with the majority of waves — the ones with with other amplitude:wavelength ratios? Can they still be used for forming circumsinusoidal regions? The answer is yes — but the cost required is that semicircles may no longer by used in their construction. A semicircle can be thought of as a 180 degree arc, if the diameter, often considered part of its perimeter, is ignored. When the sine or cosine wave’s amplitude:wavelength ratio is not equal to 1:4, the only necessary adjustments for the circular arcs needed to define particular circumsinusoidal regions are identical changes in the angular size of each arc used, plus translations of the centers of the circles which contain each of these circular arcs. These translations move those circle-centers away from the line representing the wave’s rest position, in a direction perpendicular to that line. There are two cases to consider: shorter-amplitude waves (those with an amplitude:wavelength ratio smaller than 1:4), and taller-amplitude waves (where the same ratio is greater than 1:4). The first picture below shows the shorter-amplitude case. 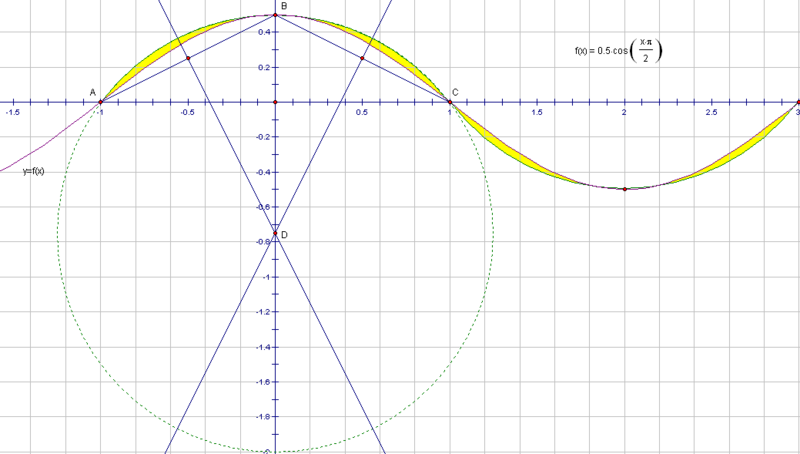 For every half-wavelength which starts at the rest position, an arc through three points is needed for the outer bound of the circumsinusoidal regions, which are shown in yellow. Those three points are two consecutive points (such as A and C above) where the sinusoidal wave crosses the rest position, plus the point at the top of the wave crest (such as B), or the point at the bottom of the trough, exactly half-way along the sinusoidal curve, in-between the two consecutive rest-position points under examination. In this example using points A, B, and C, above, the circle containing those points was constructed by drawing segments AB and BC, and then constructing the perpendicular bisectors of those two segments. Thone perpendicular disectors intersect at some point D, which is the center of a circle containing A, B, and C. The part of this circle which is not used for the arc through A, B, and C is shown as a dashed arc, while the arc used is shown as a solid curve. For other half-waves, to the left or right of this circle and arc, the construction would proceed in the same fashion, but is not shown, for the sake of clarity. The taller-wavelength case also can be constructed, using the same procedure, as shown below. These regions, of course, have area. To determine the exact area of any circumsinusoidal region requires integral calculus, and this area is equal to the difference in the areas under two different types of curve. Without calculus, the best that can be found for these areas are mere approximations, not exact answers. I am leaving this find-the-area problem for mathematicians who have a better understanding of calculus than I possess. 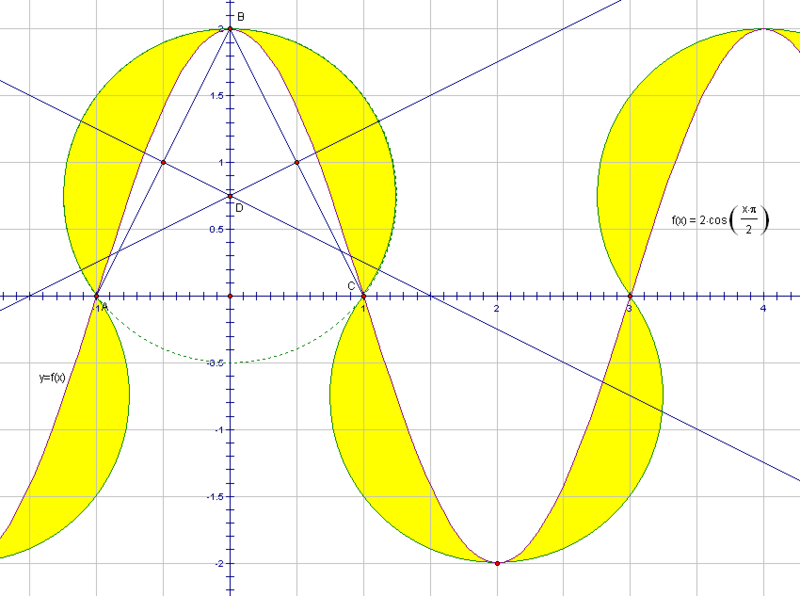 This entry was posted in Mathematics and tagged arc, area, circle, circumsinusoidal, cosine, geometry, Mathematics, region, sine, sinusoidal, trigonometric, trigonometry, wave by RobertLovesPi. Bookmark the permalink. The area of one region for f(x)=a*cos(pi*x/2) (assuming I didn’t mess up anywhere) is: (a²-1)/4a-2a/pi+(a²+1)²/8a²*(pi/2+sign(log a)*(pi/2-arcsin(2a/(a²+1))). Plain-text boxes make these things a pain to input. They do, indeed. Sometimes I’ll use screenshots as a workaround.